August 17, 2018 Well, that was fast. Blizzard has already released a hotfix that kills this exploit, less than day after it was discovered. 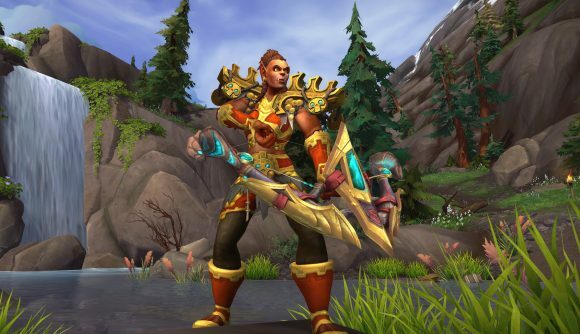 The exploit allows players to easily grind up their cooking skill in World of Warcraft’s new Battle for Azeroth expansion, but it felt too easy to a lot of players – clearly it was, as Blizzard have put a stop to it. It involved the starting Mon’Dazi dessert recipe, which players can simply buy a load of ingredients for from a single vendor, and multiplying the recipe’s requirements by 200. So did Blizzard patch out the recipe? No, the problem was with the vendor apparently. Players aren’t supposed to get all these ingredients from one place – in fact Aromatic Fish Oil, a key component in the recipe, is probably only meant to be collected by manually making it using fish. So the developer simply stopped the vendors selling this fish oil, and immediately killed the exploit. Now you have to grind your fish like civilized people. Battle for Azeroth is upon us, and that means it’s time to rethink your whole World of Warcraft levelling strategy. Yeah, sure, getting XP by killing monsters and such is fine enough, but what about building up the more important levels, like cooking? Players found an easy method to build that skill – too easy, apparently. A starting recipe, the dessert Mon’Dazi, requires ten Wild Flour, five Foosaka, two Aromatic Fish Oil, and four Powdered Sugar. It just so happens that all those ingredients were sold by the same vendor. That’s Henrick Wyther in Tiragarde Sound and Boralus on the Alliance side, and Hanul Swiftgale in Dazar’alor and Zuldazar for the Horde. As Redditor JordanTH noted, you can just multiply those item requirements by 200 to reach a 110 cooking skill in no time – depending on luck with drops, of course. Just make sure to pause and rank up your Mon’Dazi in the meantime once it unlocks for better progress. You might also consider just doing 100 Mon’Dazi for your grind, and spending the rest of your time crafting 100 Kul Tiramisu, the ingredients for which are also available at those convenient vendors. Both meals are ingredients for the Bountiful Captain’s Feast, which is one of the top recipes and likely one of the reasons you’d want to do the trick in the first place. The method’s so easy that some players speculated it’ll be patched out. The idea is that you’re intended to get the fish oil from actual fish, and it might be dropped from vendors soon once Blizzard catches a whiff of what’s happening. They were right, obviously. If you haven’t jumped into the new expansion yet, check out our World of Warcraft: Battle for Azeroth day one review, and stay tuned for further coverage throughout the week.